Sea anemones are a very beautiful and interesting marine organism belonging to the taxonomic Class Anthozoa, which also includes the coral and sea fans. Sea anemones have radial symmetry (cylindrical), and are mostly sessile (non mobile), attaching themselves to rocks or other nonliving material. Their squat body is topped by a ring of tentacles which are often colored in many spectacular hues. As such, they somewhat resemble a flower, and were in fact named after a small wild flower of the Genus Anemone. 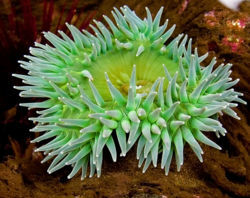 Anemones have a cylindrical body, with an oral disc mouth and tentacles surrounding it, and an adhesive ’foot’ for holding onto rocks and coral. It is hence, a normal polyp shape. The tentacles have a unique cell on the end of each called cnidocytes. Cnidocytes have cnidae that have nematocysts which are the ‘stingers’ that hold the poison that defends and feed the anemone. These poisons or ‘toxins’ are named actinoporins, and are actually a sensitive hair that releases the poison cells at the moment of contact. These toxins contain neurotoxins, which are the paralytic addition to the poison these actinoporins excrete. Anemones exist as divided sexes: male and female. Anemones have the ability to reproduce in many different ways. In sexual reproduction the male releases sperm into the water that finds its way to the female anemone with the egg that is then fertilized. After fertilization, the egg grows into a ‘planula’(which is described above as a cilia covered larvae) then finds a spot to temporarily and finishes its last stage of life as a full grown polyp. Asexual reproduction has many different forms with the anemone. Binary fission, which deals with DNA replication. Pedal laceration which also combines with regeneration, results from a split piece from an anemones pedal disk. Budding occurs when an anemone forms a protrusion and from that another anemone begins to form from the mother anemone. A normal anemone, when given its full lifetime of up to three years, can grow up to 18 inches. Many anemones have special symbiotic relationships with crabs and clownfish. Each use their natural abilities to benefit each other. The anemone uses its foot to secure itself on the crabs hard, flat back. The crab will move around and the anemone will eat any loose food particles from the crabs meals. In turn the anemones stinging tentacles are helpful in protecting the crab from predators. The clownfish lives inside the anemones tentacles, and like with the crab, the anemone eats the food particles off the clownfish. The clownfish has a strange characteristic that scientists are unaware of that makes them immune to the deadly actinoporins the anemones cnidae produces. Anemone's look like brilliant colored flowers, but are actually very aggressive predators. A recent article by Live Science, titled Enemy Anemones Wage All-Out War described a recent discovery in which anemones act as an army. They stated that, although anemones have no brains, they all seemed to work together (weaker ones in the middle, stronger ones on the outside) to create a protection center for releasing offspring. This page was last modified on 24 July 2014, at 17:06.